White noise fans produce white noises that blend the external sound into the overall background noise. As a result, your brain pays less attention to it. 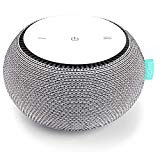 If you have landed on this page, then you are definitely planning to buy either a white noise machine or a white noise fan. Frankly speaking, I rarely use white noise fan but my wife is a frequent user of it. Every individual has a different sleeping habit. For example, If I am sleeping, there is a very rare chance that I will get disturbed by the outside noise. But the same is not true for my wife and child. At times, they get disturbed by the television volume or even washing machine hissing noise. Before I bought a white noise fan, I tried a lot of things but I wasn't successful. In fact, I wasn't getting a proper solution until my next door neighbor told me about the qualities of the white noise fan. I was a bit hesitant and skeptical in believing my neighbor words. I never thought that the fan will be so useful. But today I am a happy father and husband. My wife doesn't have any problem with the television volume. Same holds true for my child. I also advise my clients to use a white noise fan, in case their home is near the airport, railway station or traffic centric area. You can go for soundproofing your entire apartment or bedroom, it's perhaps the best option but comes with a deep cut in your pocket. So for sleeping disturbance of your child, try the white noise machine or fan. 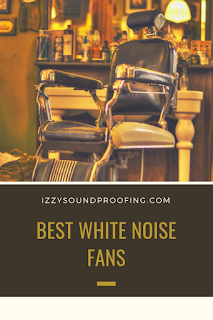 There are a lot of good white noise fans in the market and depending upon your requirement and budget you can select the one that suits you. In this post, we will be reviewing best white noise fans. It's always good to know the technicality and concept behind a particular product. Keeping the statement that I have made now in my mind, I will be taking you through the concepts and the interferences. Let's begin with the most basic question, What is white noise? In the layman language, white noise is a kind of static sound that you hear when your radio or television signal goes for a toss. You must be wondering that how this sound can help in concentrating on work or getting a night of good sleep? I had a similar thought when I first heard about the term "white noise" and wasn't very optimistic about it. White noise is a term similar to white light. White light is a combination of the frequencies of all the colors. In a similar way, white noise can be created when all the different frequencies of audible sound that human brain and ear can perceive are put together at a similar level. The range of human audible frequencies lies between 20 Hz to 20, 000 Hz. So, the white sound that we hear is a combination of all the frequencies of sound that lies between 20 Hz and 20, 000 Hz at the same level and at the same time. To make it sweet and simple, let's dig into two scenarios. Scenario 1: In this scenario, you are sitting in a quiet restaurant, you can easily hear the sound of your friend sitting on the adjacent table. Scenario 2: You are in a cricket stadium waiting for the game to start. There will be a thousand persons speaking at the same time. As a result, you will hear a blurred sound. So, white noise is similar to scenario 2. Since we have now a fair idea of white noise, let's discuss its benefits. As white noise consists of all the audible frequencies, the best use of it is to mask the unwanted noise. Be it an office, home or some other venue, you can run it in the background and it will take away the unwanted noise with it. Your brain loves the stimulation and being active, any noise like vehicle horn or train signal keeps your brain stimulated, involved, and active even during sleeping hours. These unwanted noises are masked with the help of white noise, which is constant in nature and runs in the background. The white noise prevents your brain from getting over excited when it hears a sudden noise in the night. If your baby is newly born, then white noise will be similar to blood running in the womb of the mother. A constant noise provides a great ambiance to the baby and thus, helps it to sleep longer. I have a personal experience of getting benefited from white noise fan. My friend's father was diagnosed with cancer and had to go for several rounds of chemotherapy. He got tinnitus as the permanent side-effect. White noise helped my friend's Dad a lot during sleepless nights, stressed moments, illness and so on. In case you or any of your family members are suffering from tinnitus, you can try white noise fans. I have seen lots of people finding sounds of rainfall, ocean, forest, and waterfall relaxing and joyful. You can also give it a try. It's a good decision to use a white noise fan in the office or at home. The fan produces a constant noise that helps in masking the unwanted noise. I have tried a few time, the white noise fan while I was writing an article or preparing a presentation for my client. The best part about the white noise is its ability to maintain an ecosystem of constant noise. It completely neutralizes the impact of variation in noise volume. For example, a sudden whistle, a bike horn etc can take your concentration for a toss. The white noise prepares a background of constant noise which masks the loud pitch of the unwanted noise. As a result of low distraction, your concentration will automatically improve. Where you should place the white noise fan for maximum effectiveness? Every individual is different and definitely has a requirement that may or may not vary with others. The fan features and the place you are planning to place the fan really makes a difference. It's not always necessary to buy the most expensive fan and vice versa. You can follow these three steps to find the correct white noise fan for you. Look for all the feasible options. Select the one which suits the best. For example, if you are looking for a white noise fan for your baby, then you don't need to go for a big one. A portable small white noise fan is all you need to give your baby a nice sleep. But at the same time, the requirement of a conference room will be different. Similarly, If you are looking for your bedroom, you need to check the potential space available in your room, need of a smaller or bigger fan also depends upon the location of your apartment and the distraction caused by outside noise While reviewing the fan, I will also highlight the potential customer for the product. Some of the basic qualities you need to look for are loudness, portability, and airflow. Moving further, I will also throw some light on types of fans, the material used, and price. While reviewing a product I always try to highlight not only the positive side but also the negative ones. Sometimes, my readers loyal to a particular brand finds it difficult to try some newcomers. It's very normal and if you are happy with your current brand then please go for it. Most of the brands are spending tons of money to retain their customer and as a result, some of the brands are even successful in achieving it. It takes a while to build a brand from scratch. Our review is totally based on the capabilities of a product to perform against certain set parameters. There are a variety of fans available in the market and types of fans itself is a relative parameter. Depending upon your set parameters, you can define fans into different categories. Today we will be talking about three well-known types of fans which are not only available in abundance in the market but have also proved their mettle. 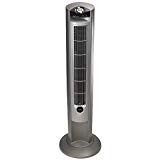 To start with, the first name in the list is of ordinary fan, a very common name in the household, these fans have a fairly large stable base. The fan blades are protected by a plastic or iron grill. To cover a larger area, you can set the fan head in the movable mode. In this mode, the fan head keeps moving in all the possible direction for better airflow. Second in the list is a well-known tower fan, used mostly in the small apartments and bedrooms. As the name suggests, these fans have a slim tower which takes less space. In case you want to cover a larger space using this fan, then it's not a good idea as the fan doesn't have a movable head. The blades of the fan are hidden inside the tower. Third on the list is the box fan. These fans have lots of variants. You can find different shape and size of box fans. You can use in your cubicle, study room, home office etc. A bigger version of these fans is used in the factories and industries. They are rectangular, circular or square in shape and don't have moving parts. Moving further, we will throw some light on the features of these fans. By knowing these features, you can decide the best fan for you. The loudness of a fan is directly proportional to the speed. 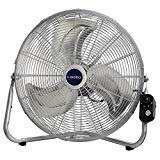 A louder fan is mostly recommended for warehouse or other office outlets. In case your house is near the roadside, you can buy a fan with a louder noise. When it comes to buying a white noise fan for the only sleeping purpose, then buy a fan with a moderate sound. Box fans are the loudest because of the high speed of the fans. Because of this feature, it's the first choice for office, factory, and warehouse. The portability of a fan depends upon two parameters, that is, size and weight. Some variant of box fans is extremely small and lightweight. Same holds true for ordinary and tower fans. Depending upon an individual need, S/he may opt for an oscillating or fixed fan. Compare the strength and capacity, that is, the oscillating rate of a fan which you are planning to buy with the other variants. By doing so, you can get a fair idea of the airflow rate. These fans are made up of a variety of elements, that is, iron, steel, plastic or so on. The lighter and portable fan generally prefers plastic. On the other, the industrial fans are mostly made up of heavy metals. Whether you buy a fan made up of plastic or iron, you need to take proper precaution, so that it may last longer. Price is one of the important deciding factors when it comes to buying a white noise fan. Needless to say, fans with the idiosyncratic superlative feature are costly. 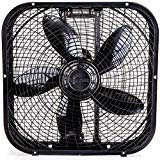 Mostly, I will be discussing the fans under $100 and these fans can be a good option for you to get rid of unwanted noise. So, without further ado, let's see who all made to the list. The fan is among my favorite. Whenever I travel, this fan is traveling with me. This fan stands tall at 6 inches, weighing 7.8 ounces, along with LED lights attached to the sides of the fan. What more can you expect at $20? The reason I prefer this fan for traveling is it's portability and charging options. You can charge it using your laptop, power bank, plug or you can run it on rechargeable 3350 mAh battery which will last for at least 8 hours. One another important feature is the fan speed. It comes with three-speed options, maximum being 3200 revolutions per minute. I will recommend this for traveling and sleeping purpose. USB and 8 hours of battery backup. A maximum speed of 3200 rpm. Before reviewing this fan, I was going through the feedback on Amazon, Let's see what buyers have to say about this fan. Great fan for travel in the US or Europe. Stop debating and buy this. It's awesome. Great for summer! Love the USB charging capability. Though I am a frequent user of this fan and never faced any problem in terms of customer service or battery life still you can take your own call. When I am writing this article, around 1667 buyers have reviewed this product on Amazon with an overall rating of 4.4/5. As the name suggests, the fan is 10 inches in size and weighs 2.7 pounds. The fan has a wall mountable option and designed to be used in a living room or bedroom. The tilt adjustable head allows you to direct airflow as per your need. If you want the airflow on your face, simply tilt the adjustable head accordingly. The fan comes with two-speed setting options. If you are planning to buy this fan on Amazon, then these positive and negative comments by the buyers may help you to take a final call. Powerful, white-noisy enough for baby, but not obnoxious. Not good for white noise. My concern with this fan is its plastic body which is a hard hit on the durability. Though there is a less chance of the fan getting toppled because of the firm base still it's better to exploit wall mountable option. Standing tall at 42.5" makes this fan a favorite choice for 20*20 feet room. Depending upon the height of your room mattress, you can adjust the height of this fan. You will not experience any rattling as the base is extremely sturdy. The fan also comes with an ionizer which gives it an edge over the competitors. The ionizer adds millions of negative ions in the air, giving a feeling of fresh outdoor air.You can use this fan for white noise as well as air oscillation in your bedroom to avoid any allergy. For the best results, you can use it 4 feet from the surrounding walls and furniture. Whenever I pick a product for review, I definitely try to do some online research so that I can present the best feedback to my readers. Definitely, I am very grateful to you, Guys, for this whacking response. Keep appreciating our work, It gives us positive vibes. Let's see what people are talking about this product on Amazon. 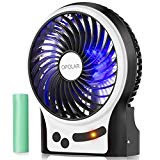 More than 8000 buyers have reviewed this white noise fan on Amazon and the overall rating of this product at the time of writing the article is 4.1/5 which is definitely a good thing if you are making up your mind to buy this product. What a great fan at a great price. Fantastic value, cool and quiet. Started making noise after one month use. No air flow at all. If you are looking for a white noise fan for the only sleeping purpose, then you can't have a better option. Trust me, you can't. This fan gives you 10 settings for changing the speed. You can select as per your requirement from small stir to a loud roar. An added value that this white noise fan provides is the option of adjusting the tone of the white noise. By simply twisting the outer shell, you can change from light fan to deep fan tone. Some other benefits include portability, remotely control and so on. You can download the companion app available for both iOS and Android and start controlling the fan remotely. Remotely controlled by companion app. Since this fan gives an option to change the tone and volume as per the need, you can set the comfortable tone and volume for baby, kids, pets, and even adults. So, the same white noise fan can be used for different members of the family. As compared to its competitors, it produces non-looping white noise which is very peaceful. The ultra-efficient brushless DC motor makes it highly energy efficient. You may not believe but it uses an energy equivalent of 6W LED bulbs. Do you know, what does it mean? It means the power consumption of this white noise fan is 98% less than the other average box fans. To give you a glimpse of what the buyers are talking about this product on Amazon, I have shared the positive and negative comments or feedback. The product does block all of the outside noise. Has helped me sleep on my travels. The time I am writing this article, almost 182 people have reviewed this product with an overall rating of 4.6/5. This white noise box fan(3.75 x 20.5 x 20.5 inch) is a good option for medium and large rooms. To increase the stability, you can use attachable feet. For cleaning purpose, you can use a removable grill. The 3-speed settings help you in controlling the air flow. The company claims to be energy efficient, that is, costs less than 2 cents per hour to operate. 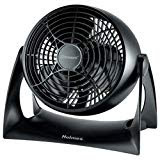 The 20-inch fan blade helps in proper air flow and circulation. The uniqueness about this fan is the patented blade design which claims to provide maximum airflow. Great fan for the price. Loud and rattly low-quality fan. The overall rating at Amazon is 3.4(5) and this white noise fan is reviewed by 2973 person. I have included this white noise fan in my list for my readers who are tight on budget. If you are looking for a fan under $30, then definitely you can go for this fan. Lasko is a well-known brand in the white noise segment. Already I have recommended the Lasko wind tower oscillating fan which according to me is the best white noise fan at a reasonable price. Let's get back to Lasko 2265QM which uses patented safety plug. This is a high-velocity fan which can be used for non-household type environment such as garage, office and so on. These fans are loud and move a lot of air even at low speed. ETL listed, patented fused safety plug. Rubber pads to protect surfaces. A powerhouse of a fan! Moves air like a whirlwind. I will not recommend it for your study or sleeping room. Almost 5000 people have reviewed this product on Amazon and the overall rating for this product is 4.3(5). Before we conclude, let's have a look at two of the handpicked articles. 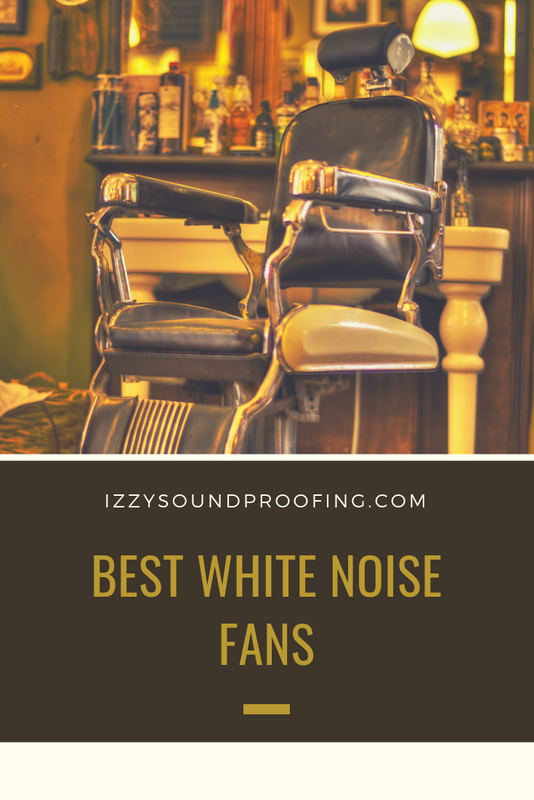 I hope this white noise fan product guide will give you a piece of complete information about white noise fans. Now, you can very well set the parameters and take the decision. White noise fan can help you in getting sound sleep or increasing your concentration but at the same time, you need to look for an ecosystem that supports the effort made by the white noise fan. Though these fans are best in the market under their categories still we can't assure you that these fans are alone enough. At times, you may need a soundproof curtain or a soundproof blanket for the best output. Even though you didn't find your perfect white noise fan, then also at least now you can figure out, "what really you are looking for?". This post is more of a guide and I have mostly included the fans which have come out with flying colors on three parameters, that is, value for money, durability, and noise level. I will recommend you to buy a white noise fan because it can also increase the air circulation in the office or your bedroom. For those who stay in a humid climate, these fans can do wonders. Last but not least, to concentrate on your study or your job, you need a sound sleep of eight hours. Insomnia can lead to stress and anxiety. So, you need to first fix the sleeping problem for a peaceful and happy life.